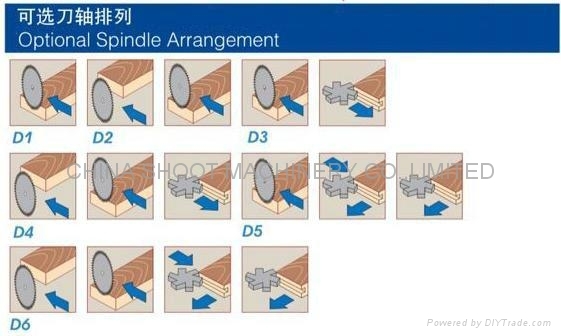 Each spindle can rotate, convenient to achieve angle-truncate, tenon, groove and etc. Adopted widen by high precision linear orbit, machine can run in precision and wearable. It assure the precision when widen the working size, also can guarantee to fit your highly requirement for setting the working width. Orbit lubrication can reduce the frictions of slide when moving, increase the nature life of orbit as well. The cut-off saw equiped 4KW(11KW) motor and can be installed hoggers, which is quite suitable to process the big cutting capacity materials. Each spindle is configureed with read out, can display the position of spindle veracious. Adopted touch screen makes the operation convenient, rapid and visualized, reduce the labor intensity and time, improve efficacy. Setting all of the parameter by PLC, easy to view and control. Reduce labour and the time for setting parameter, improve the produdctivity effectively. Through the automatic locking which controlled by PLC, can lock the linear orbit automatically. 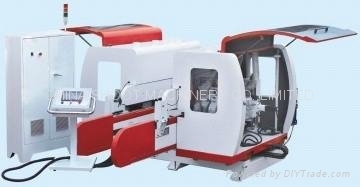 No only can reduce the labour but also can assure the stable of the machine base, improve the quality of the work pieces. Adopted excellent material to make of the pressure belt, keep good wearable. Sealed safety enclosure is controlled by pneumatic, can reduce noise levels, improve extraction and operator safety.